When a certain pomegranate-loving just turned 4 year old was asked what she’d like for her birthday treat, she was adamant that she wanted pumpkin pomegranate cupcakes like last year. 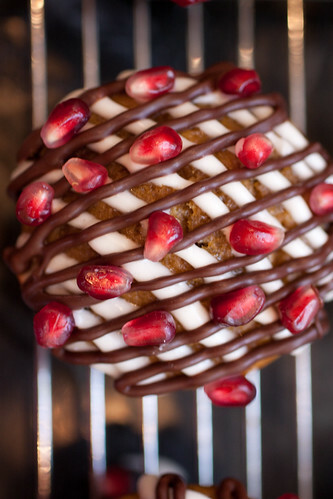 This year we played around to make them even more to her liking – adding chocolate chips to the pumpkin batter and drizzling cream cheese and chocolate on top to showcase her beloved pomegranates. The birthday girl’s wish? 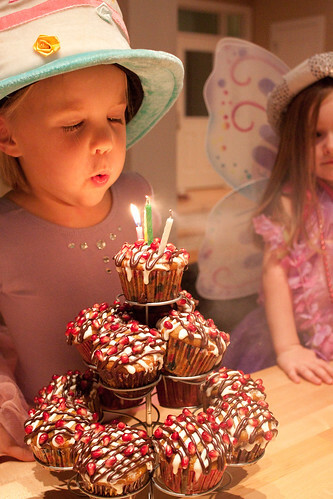 To have these again next year when she turns 5! Preheat oven to 350°. In a large bowl, beat together the oil and sugars. Beat in the eggs, pumpkin, water, and vanilla. In a separate bowl, whisk together the flour, baking powder, baking soda, salt, and nutmeg. 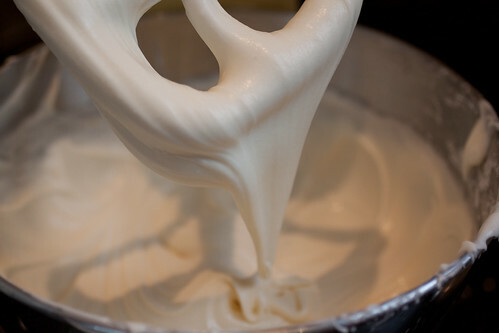 Add the dry ingredients to the wet ones and stir to blend. Then gently stir in the chocolate chips. Using your trusty disher, scoop the batter into the lined muffin tins. 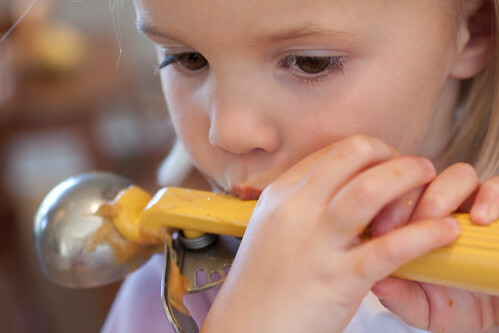 Reward your special helper by letting her lick the disher. Mix cream cheese, butter, sour cream, and vanilla at medium high speed of standing mixer until well combined, scraping down bowl with rubber spatula as needed. Add confectioners’ sugar and mix until very fluffy. Very fluffy? Ha! For me, this made a very soft but tasty icing – one that wasn’t firm enough to pipe, even after an overnight rest in the ‘frig. So I used my squirt bottle to drizzle it instead, along with a chocolate layer of melted chips. If you prefer a stiffer yet sweeter icing that you can pipe, just add more confectioners’ sugar – up to an additional 3 cups. 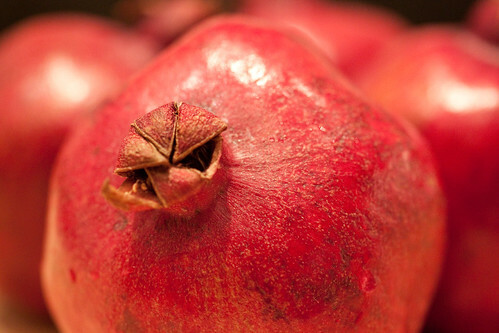 To minimize the mess and stains from seeding a pomegranate, here’s a tip – work with it in a big bowl of water! Score it and them break it apart underwater. The ruby red seeds sink to the bottom as the white pith floats to the top and can easily be strained off. 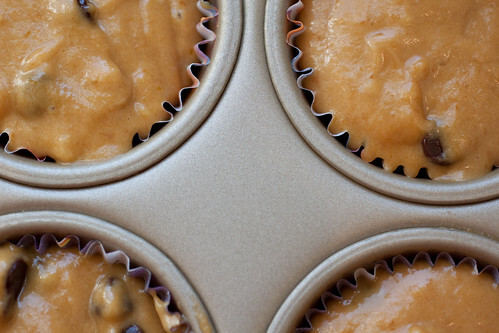 Dry the seeds and place them on the cupcakes while the drizzle is still wet. 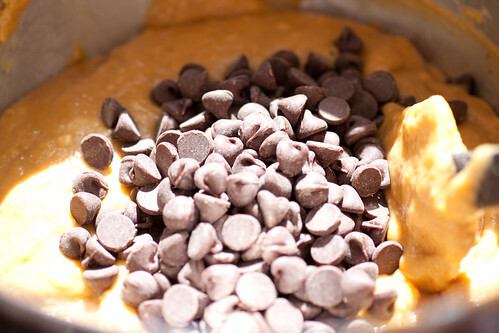 Add 1 cup (4 ounces) chopped and toasted walnuts or pecans when you add the chocolate chips. Omit drizzle and pomegranates and instead top with chopped nuts and coarse sugar. For bread: Spoon the batter into two lightly greased 9 × 5-inch loaf pans. Bake the bread in a preheated 350°F oven for 1 hour, or until a cake tester inserted in the center of the loaf comes out clean. Cool in pans 10 minutes; remove from pans, and let cool on wire racks. Yield: 2 loaves. 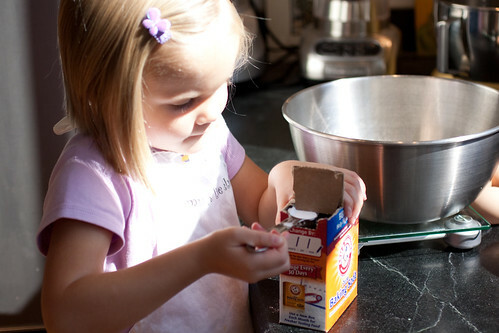 For mini-muffins: Divide the recipe by 1/4 to get 18-24 mini muffins. Bake for 12-15 minutes. For a ganache topping (2 chocolate: 1 cream): 5 1/2 ounces chocolate and 2 3/4 ounces cream makes enough to dip 36 mini muffins. 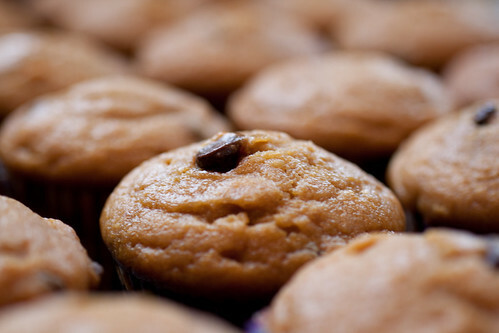 For pumpkin muffins: Omit chocolate chips and add 1 teaspoon ground cinnamon, 1 teaspoon ground cloves, 1/4 teaspoon ground ginger, and 1 cup (6 ounces) plumped raisins. 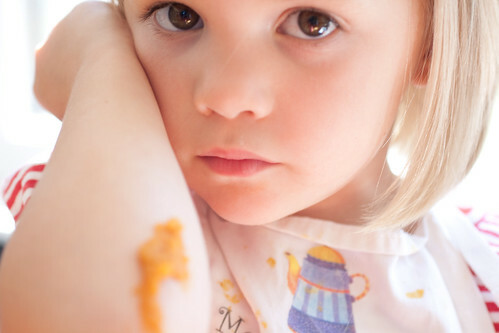 Pumpkin Elbow is much preferable to Nursemaid’s Elbow! 8 Responses to "Pumpkin Pomegranate Cupcakes"
Gorgeous cupcakes and adorable dressed up beauties as well! What a creative idea! 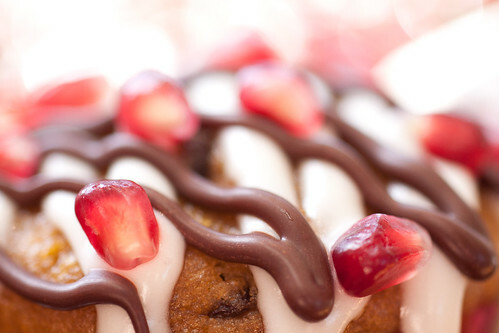 I love Lindy’s unwavering passion for the pomegranate! Happy Birthday, Lindy! Three cheers for parents who let their kids lick the batter bowl!! Happy birthday to Lindy! Wish we had a diagnosis of pumpkin elbow around here, too. Oh my goodness! I didn’t know I could lust for food. Those look delicious! Good call, Lindy and HAPPY BIRTHDAY!!! I don’t know what are more beautiful: those pomegranate cupcakes or that little girl! She has great taste for a 4 year old! These look fantastic. Wow! These cupcakes look amazing! 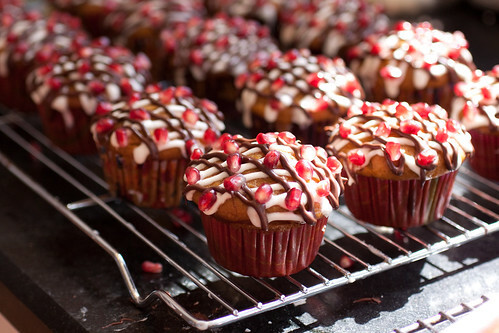 I adore pomegranates and I never ever thought of using them as a cupcake topping. Genius! Your little girl is absolutely beautiful!